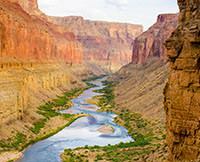 We recently joined Western River for my second trip down the Colorado River in the Grand Canyon with them. 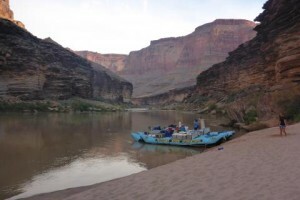 The Grand Canyon is a spectacular sight from the Colorado River and our river guides did a wonderful job narrating the history and geology of this unique spot. Western River runs a first-class operation - the boats are spacious, the food is fantastic, the camp set-up is as comfortable as one can arrange in the middle of the wilderness, and the guides are phenomenally talented people with a variety of skills from geologist to cook. This is a great trip for teenagers and above. Each day we took hikes or walks on shore to see caves and waterfalls. Some of the hikes were strenuous over desert terrain, but there was always an option for the less athletic as well. This is not a trip for those who demand creature comforts, however, because you will experience extreme temperature fluctuations, torrents of water, bathing in a cold river, and lots of sand. You are truly away from it all in a very primitive environment. But it's all worth it to be able to enjoy such a memorable adventure with Western River.